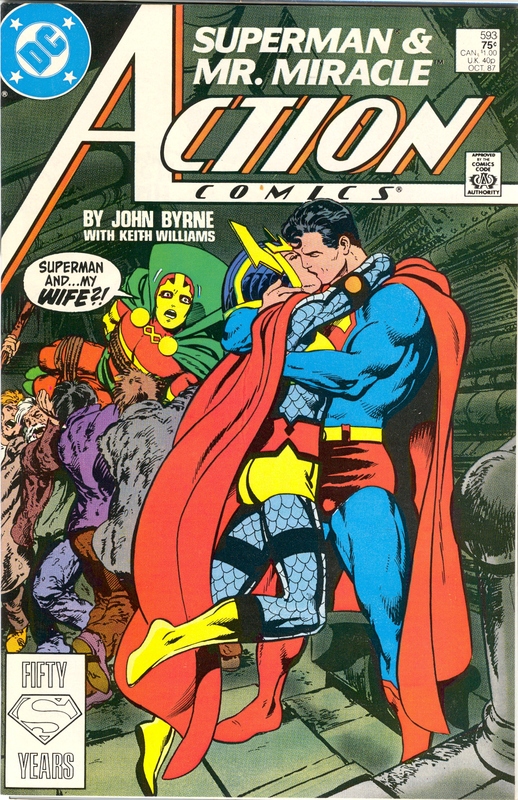 Crazy Comic Covers: Action Comics #454 "Superman's Energy Crisis"
Slow down tubby, you're not on the moon yet! 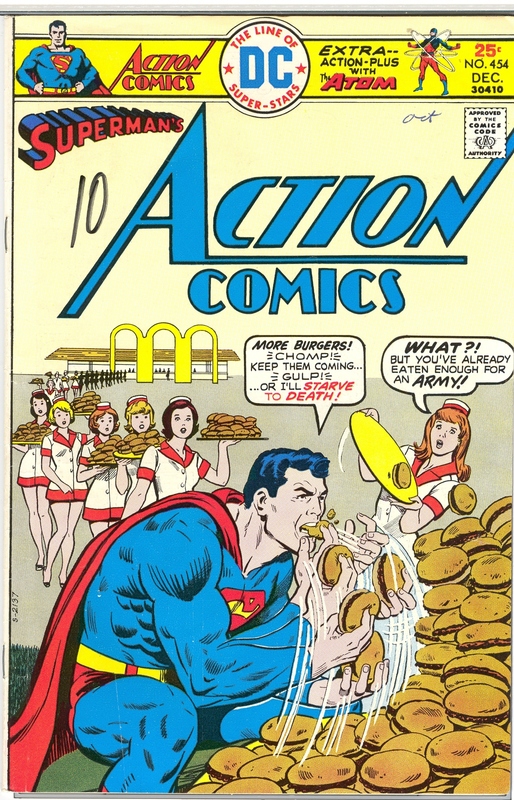 The Cover: Superman is hanging outside a Mcdonalds knock off using his superspeed to shovel as many hamburgers inside his gullet as fast as he can, proclaiming that if he stops he will starve to death. This leaves us to wonder…does he have a super-metabolism as well? As given the volume of food he is consuming and the volume of his body, he must have a super-metabolism to process the food and make super number two right in his pants to keep himself from turning into Herbie. The Story: We kick off with Toyman robbing a bank and Superman failing to do anything about it due to the lack of energy as he gets easily defeated by Toyman. We then cut away to Clark Ken reporting the news on TV where he falls asleep on the air during a commercial break. After falling asleep during the air, Lois takes him to a fund raising dinner where he eats all of the food at the table and falls asleep at the table. Having woken up at his apartment after being taken home by Lois, Superman decides to go on a patrol and after saving some civilians from a falling tree, staggers into a hamburger chain and orders their entire stock of burgers. After eating his way through his pay check, he goes out to confront Toyman again, who uses some anti-gravity bubbles to hurl Superman into space. While in space, he gets his strength back and flies back down to take care of the Toyman. Dropping by S.T.A.R. 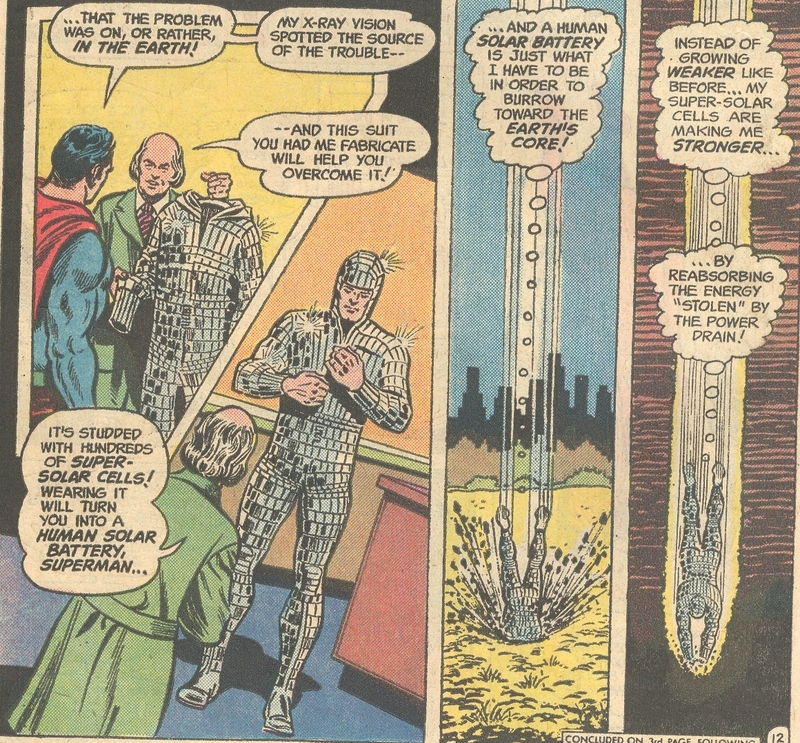 labs to confirm his suspicions, Superman learns that something is absorbing the solar energy from the Earth, preventing even “solar energy plants” from getting light. (Wouldn’t this kill off most of the plants on the planet?). Superman then dives into the Earth wearing a suit of solar energy panels to power himself and finds a hybrid of metal alloys that is stealing all of the Sun’s energy as it hits the planet. He wraps his coat of solar panels around the metal, which somehow nullifies the alloy’s ability to steal the sun’s energy (Wouldn’t this just cause a giant explosion as all the energy the alloy drains goes into the vest and overloads it?). 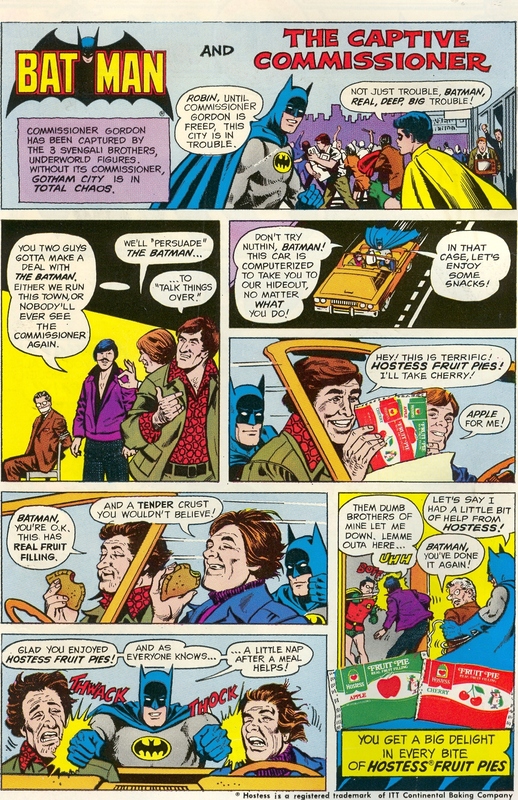 Our story ends with Clark and Jimmy stopping by the burger joint to grab a bite, but a line has formed around the block due to the infamy of having Superman stuff his Super-face with burgers there. 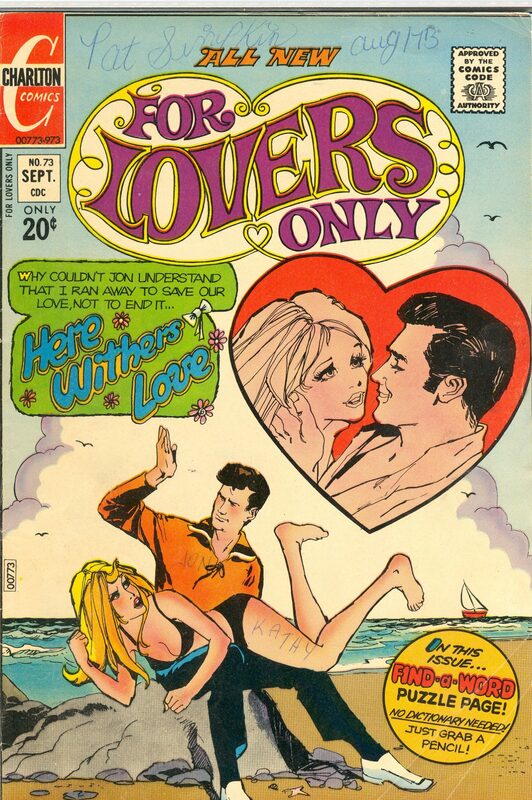 Extra: Quite possibly the highlight of this issue aside from the cover is the Hostess Fruit Pies ad in the book. Starring Batman and Robin on a mission to rescue a kidnapped Comissioner Gordon, we find the caped crusader being driven by a computerized car to Gordon’s location with two of the kidnappers. 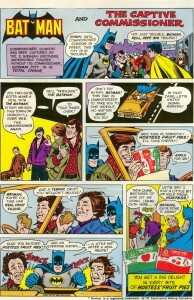 While cruising along, Batman breaks out the Fruit Pies and offers them to the kidnappers to enjoy. After getting these delicious treats, they proclaim that Batman is actually an ok guy!But of course, being the stand up guy he is, Batman punches the sense out of both of them and rescues the commissioner. Why did you give them the pies then punch them out? You could have just punched them out without the pies! Is it some sort of pain and pleasure fetish Batman has? The score: 9/10: We came to see Superman stuff his face like a pig with hamburgers…and that’s what we got. Terrible plot or not, we have to admit we got our just desserts.